I checked my watch. Ten minutes to the T since the last time I looked and still 45 minutes to mid tide. Closing my eyes, I pushed off the ground with my right foot using the same attitude as if addressing a stray dog. The hammock creaked violently. "I can't take this any more," I said sitting up in the midday heat. "I'm getting in the water." "Patience, patience. Give it another hour or so," Cris responded from a chair some 10 feet away. Keeping his attention transfixed on cleaning the sand from a small sea shell with a pliers and needle, he continued, "the tide's still too high, it will be all closeouts." "I know, but this is killing me. I can hear them breaking," I said grabbing my Fish from the rack and haphazardly wrapping the leash around the board's keel fins. "I'll see you out there then." Cris looked up from his afternoon work with a sheepish grin, conveying at the same time both his disapproval and support of my eagerness. I first met Cris in the spring of my senior year at the very same beach in Nicaragua. Escaping the cold New England winter, two close friends and I cut class for a week and headed down for some surfing. Cris introduced himself within 10 minutes of us arriving at the beach. Over the next week and a half, we made fast friends. Cris's path to happiness contrasted with the one presented to me from elementary school on. After serving in the Navy during the Vietnam war, he worked for 35 years as the custodian of the Watsonville Post Office in central California. During his time at the Post Office, he took one class per semester at the local community college, studying topics from math to dance. 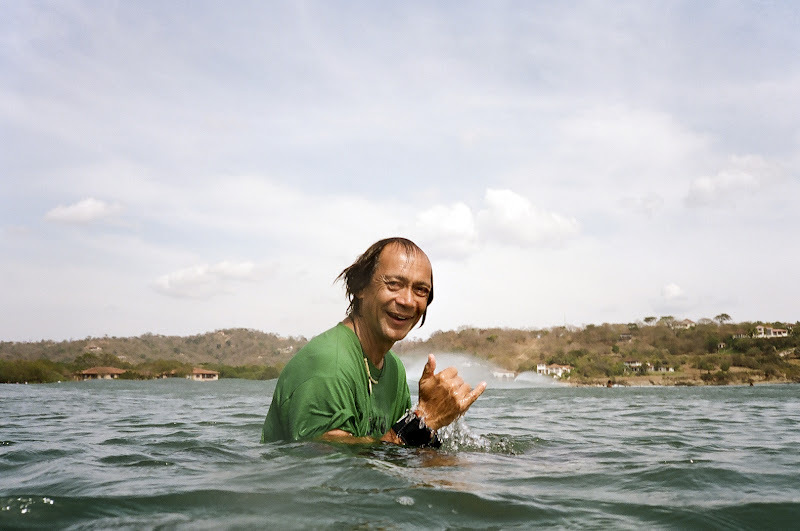 He surfed when he could and used his vacations for backpacking trips exploring the mountains of California. 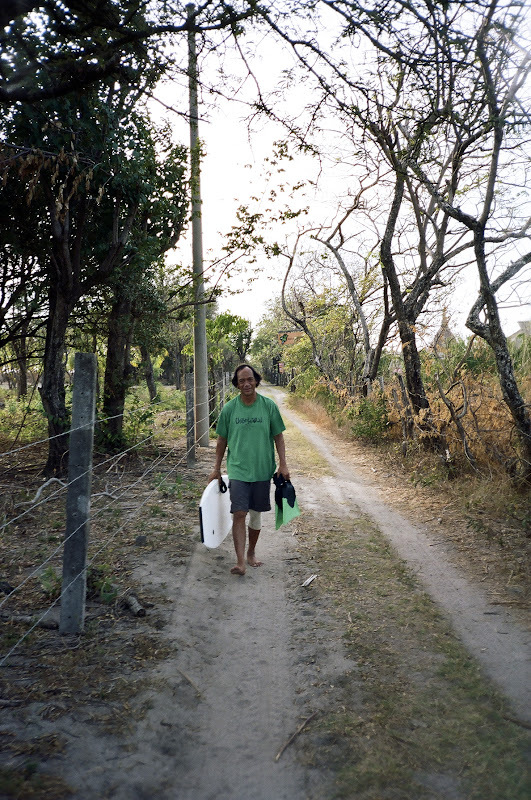 Taking advantage of an early offer for retirement, Cris had recently focused his energy back towards surfing and creating art in various mediums. On a whim, Cris headed to Nicaragua for a month long trip by himself after seeing a show about the break on Fuel TV. I grew up in a world where the path to happiness was an impatient focus on achieving financial and creative success. At my college, a small liberal arts school in Maine, my peers groomed themselves for careers as doctors, lawyers and investment bankers. I wasn't above this pressure, and before I stepped foot on campus my senior year, I already had a design job lined up at Ralph Lauren in NYC. Cris's patience and appreciation of surfing, meeting new people and enjoying the outdoors forced me to reevaluate my expectations. It didn't happen overnight, nothing worthwhile does. The following winter, I took off a week from work and flew down from New York with my younger brother to meet up with Cris and catch some waves. Once again, Cris's perspective was an eye opener compared to the cut-throat culture I was surrounded by in New York. Two months after returning back to New York, I started the process to leave my job. Mark Twain once said that, “Travel is fatal to prejudice, bigotry, and narrow-mindedness..." I'm not sure if Cris knows this quote or not, but he certainly embodies the ethos behind it. By the time Cris made his way down the beach with his fins and body board and paddled out, I was worn out from battling closeouts, just as he had predicted. His timing couldn't have been better. The waves shaped up and started breaking off the sandbars. For the next three hours we took turns catching waves. Cris did most of the wave riding and I did most of the paddling. Maybe next year I'll wait the extra 45 minutes. Phil took these water flicks.